With Florida and Hawaii being the only two states that were snow-free this past winter, it’s no wonder people flock in droves to the Sunshine State. Whether you’re new to the Fort Myers area, just visiting, or a seasoned resident, you’re sure to find some things you love about this beautiful stretch of Florida’s gulf coast. If the sunshine and tropical beaches aren’t enough, you’ll find attractions galore. From sportsmen (and women) to history buffs, art aficionados to nature lovers and even amusement park-goers there’s something to see and do for everyone in Fort Myers. If you’ll be visiting soon, it can’t hurt to plan a few things in advance. And if you already live there, you might be hosting visitors from the North. While you may be content playing tennis or reading your book by the pool, your company may have other ideas in mind. Florida natives might be groaning right now – thinking they know all the attractions. And they might! But keep in mind that residents often get set in their routine – and rarely explore the tourist spots that visitors might enjoy. So in case the area is new to you, or you you just need a refresher, here are a dozen great things to do in the Fort Myers area. 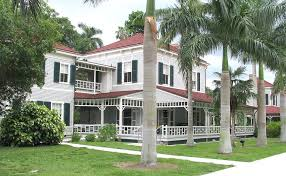 The Edison and Ford Winter Estates – (history) — If you’re thinking cars and light bulbs think again. The estate of these two inventors is that and so much more. You’ll see history revisited – along with the beauty of spectacular gardens and grounds. Nature Tours – (nature) — There are so many nature tours that we can barely list them here. Among the most popular are the Six Mile Cypress Slough Preserve, Clearly Connected Nature Tours, Manatee Guides and the J.N. “Ding” Darling National Wildlife Refuge. Each offers something different for tour-goers but all are a highly rated, great way to spend a day communing with nature! Florida Repertory Theatre – (the arts) – After a day of fun and sun, why not spend the evening at the theatre? This one, housed in the Historic Arcade Theatre, is highly regarded for their great plays, quality actors and affordable prices. There are also matinees for a rainy day – if there are any seats left! Castle Golf – (mini golf) – You don’t have to be a pro golfer to love this one! Located next to Lakes Park, this large 18-hole mini golf course appeals to both young and old with some challenging and entertaining holes. Southwest Florida Museum of History – (history) – If you like history, this is well worth the trip. Learn about the area’s early days from Native Americans to the Civil War and beyond. The kids will love the restored railroad depot. Good fun anytime – great for a rainy day! Brewery Tours – If you like a nice refreshing beer now and then, be sure to check out these two brew tours: Point Ybel Brewing Company is a craft brewery with music, beer, tours and samples. And Fort Myers Brewing Company is a small brewery with a tasting room, picnic tables and a food truck for those needing something to wash down! 31 Produce and Mining – (agriculture) – With farm-fresh produce for the picking (or eating), a farm store featuring food, gifts and crafts, and an onsite restaurant what more could you want? Fleamasters Fleamarket – (shopping) – A little bit of everything — at bargain prices. Need we say more? Tanger Outlets – (more shopping) – Great savings on designer brands. A step up from the flea market, it’s still fairly easy on the pocketbook. Verandah Golf Club – (golf) — Designed by Jack Nicklaus’s son, this course is not to be missed! In addition to the links, you’ll find a clubhouse, pro shop, practice facility and fine dining. Why not make a day of it? Zoomers Amusement Park – (games and rides) — It may not be Disney, but this indoor/outdoor amusement park is a family crowd pleaser. With go-karts, mini golf, bumper cars and an arcade (among others) there’s plenty to see and do. Baseball Spring Training – (spectator sports) – If you’re a baseball fan, you don’t need peanuts and cracker jacks to enjoy a day at the ballpark in sunny Florida. Both the Minnesota Twins and Boston Red Sox play in the Grapefruit League — a hop, skip and a jump away. Spring in Fort Myers is all of this and so much more. If you’re a senior who’s thinking of moving to Fort Myers or who already calls the gulf coast home, you might be thinking ahead to the future. If you’re ready to downsize – or needing some assistance — Discovery Village is a place you can call home. Located in Fort Myers, and coming soon to Naples and Bradenton, you’ll find independent living, assisted living and memory care all in one community. This senior living community has it all — just like Fort Myers. May 21, 2015 in Featured, Senior Living. Should My Senior Parents Still Be Driving?